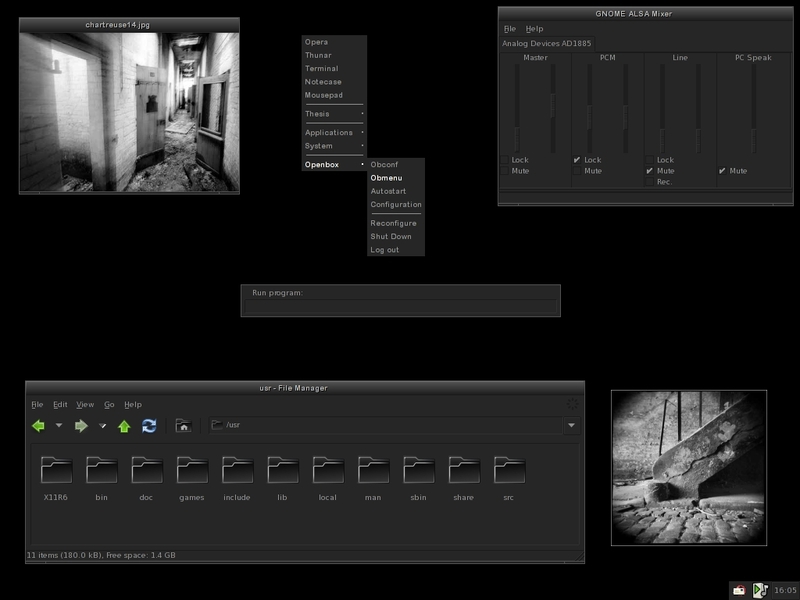 Openbox 3.4.5 with the Fearless Openbox theme, Royalty Gtk theme, and slightly modified GnomeCorsair icons. The font used is Arial Rounded MT Bold. 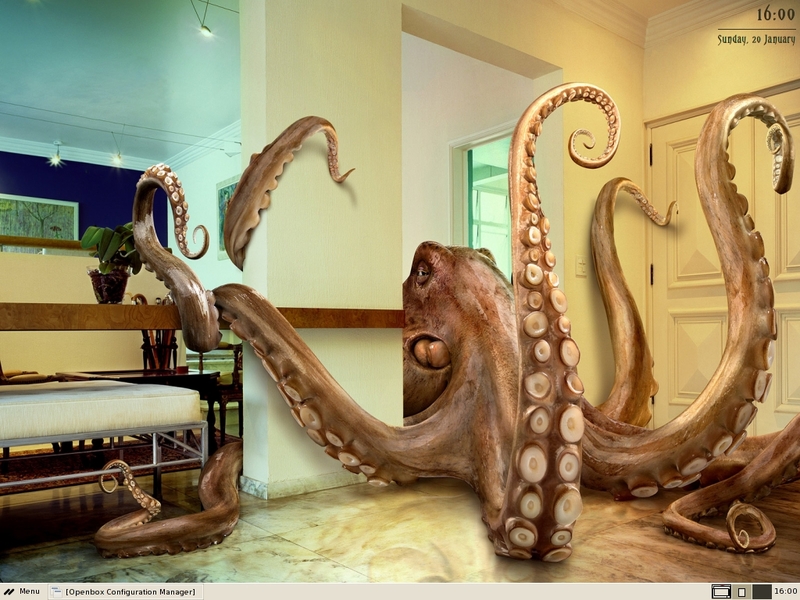 The wallpaper was created with images from this site. 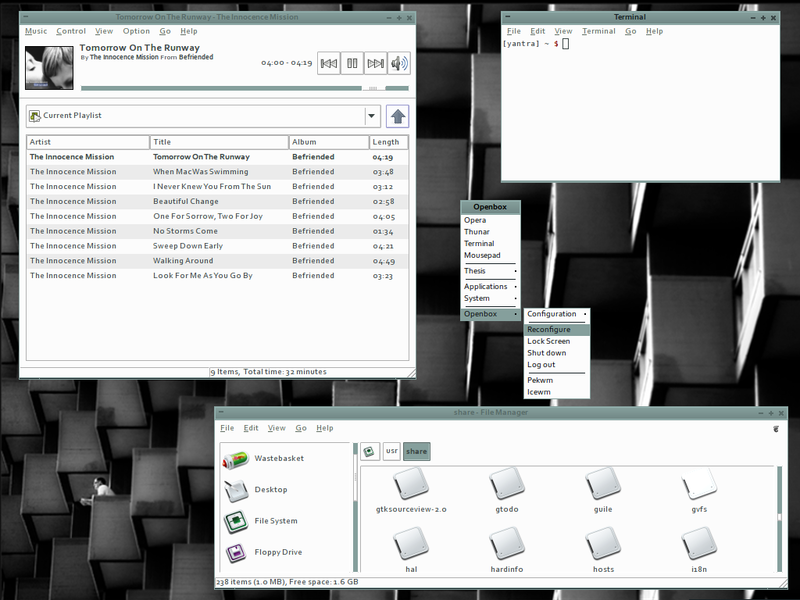 Openbox 3.4.5 with the Fearless Openbox theme, Royalty Gtk theme, and slightly modified GnomeCorsair icons. The font used is Arial Rounded MT Bold. 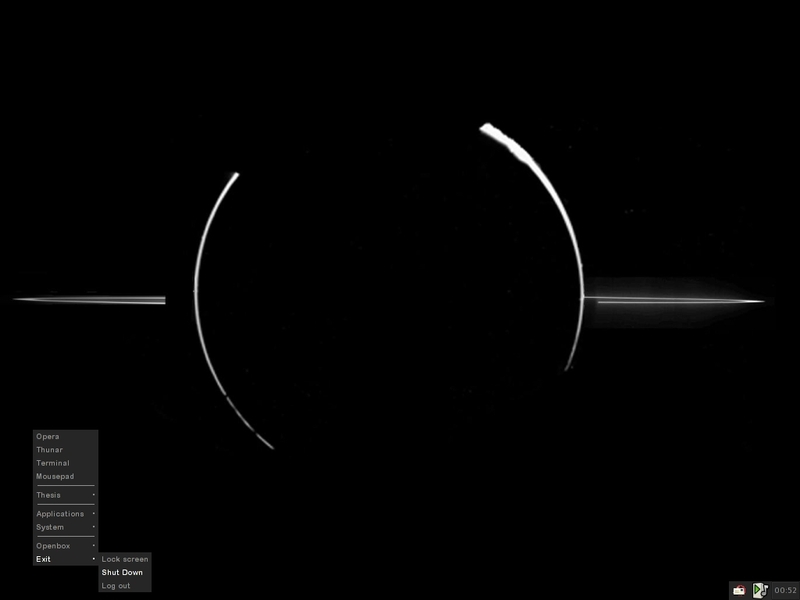 I used this picture of an eclipse of the Sun by Jupiter as a wallpaper. 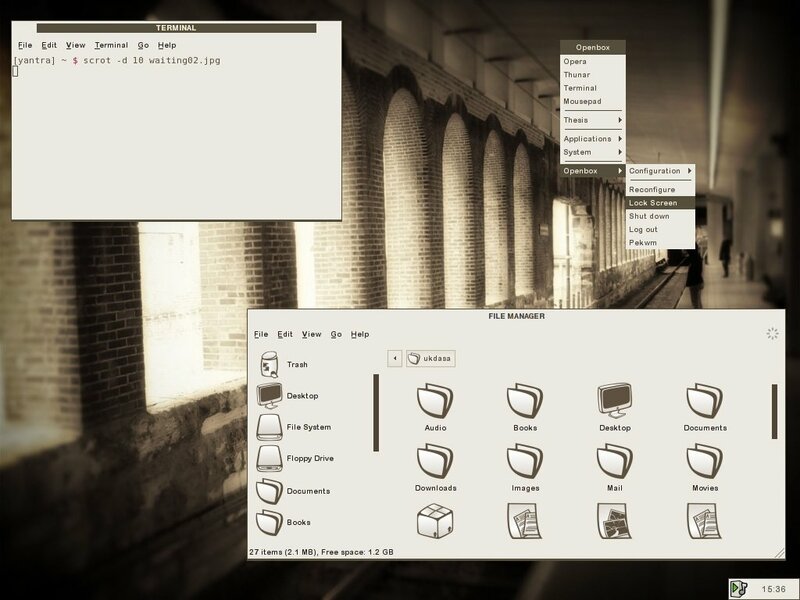 Openbox 3.4.5 with the Aeterna Openbox and Gtk theme, and nuoveXT-1.6 icons. 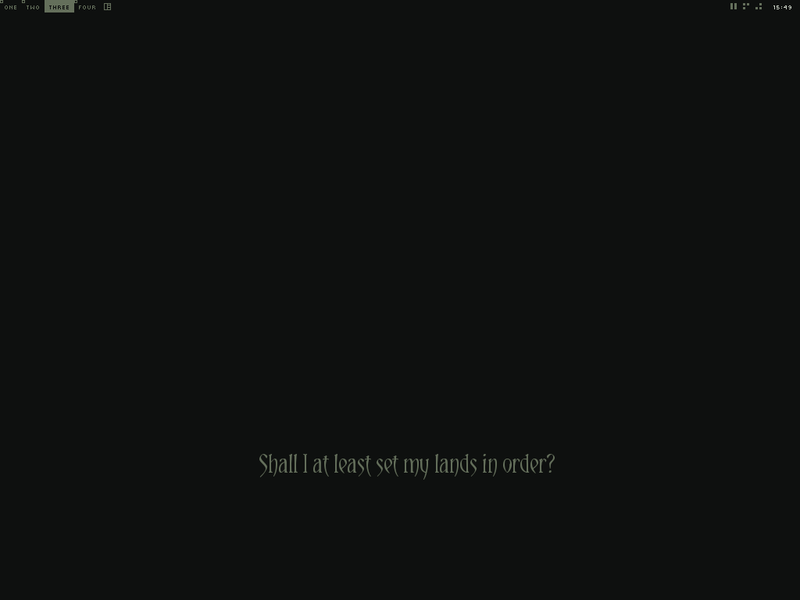 Fonts are Sans (conky and Gtk) and Arial Rounded MT (Openbox). 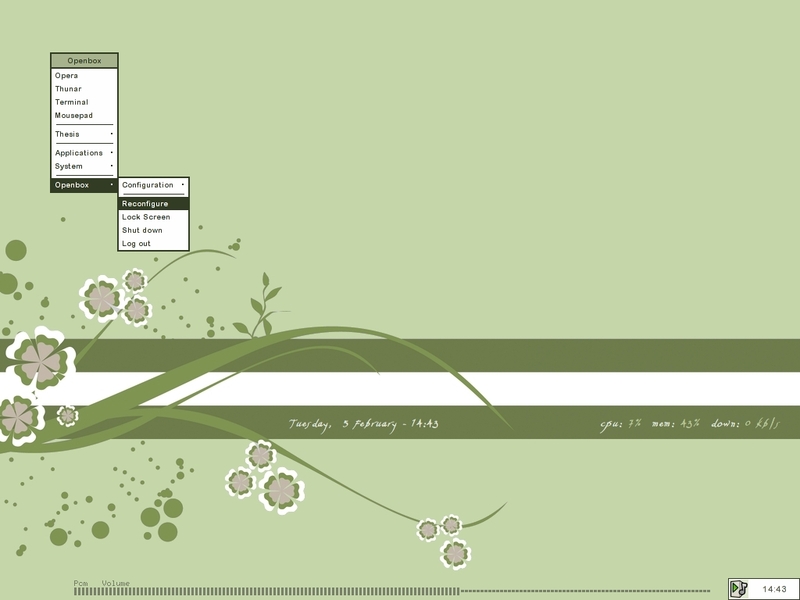 The wallpaper is Green stripes by z3ppelin. 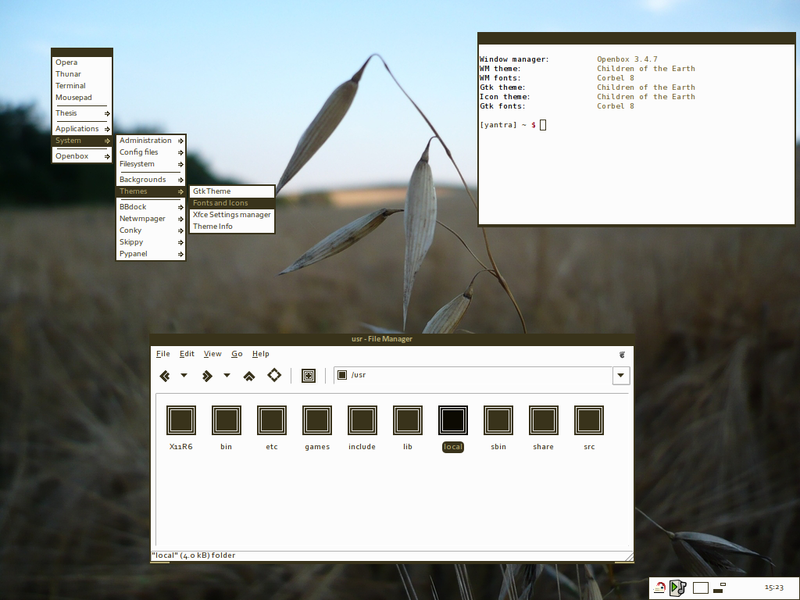 Openbox 3.4.5 with the PixelElegance Openbox and Gtk theme, and Human Ultra Gray icons. The wallpaper is a campaign ad of the Chinese WWF; the characters read Forest / Woods / Tree / Death (see here). Pekwm 0.1.6, with the Japanese Pekwm theme, modified Dandelion gtk theme, nuoveXT-1.6 icons, Sans fonts, and the wallpaper Less crap more flowers from customize.org. 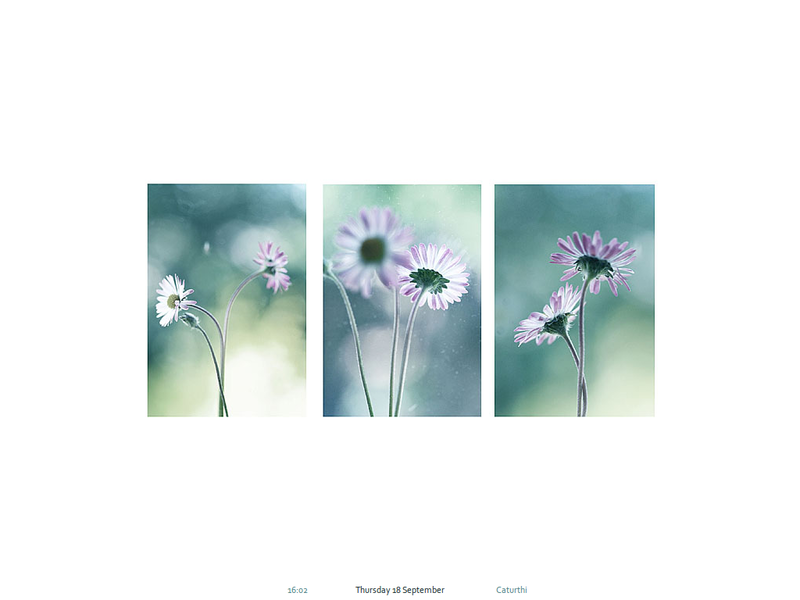 Openbox 3.4.6 with the Uncertainty Gtk and Openbox theme. 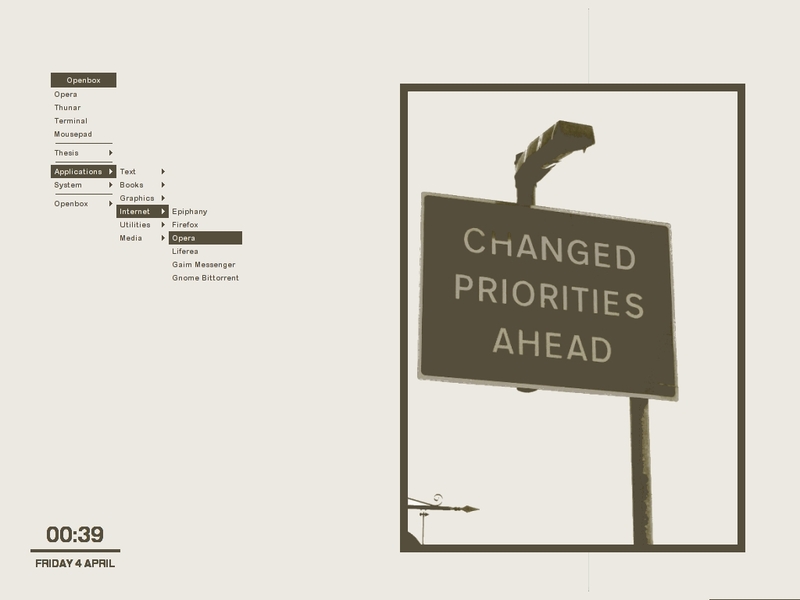 Fonts are Arial Rounded MT, HeldustryFTV Basic Black, and Aerofoil (conky). I don’t remember where the wallpaper is from. 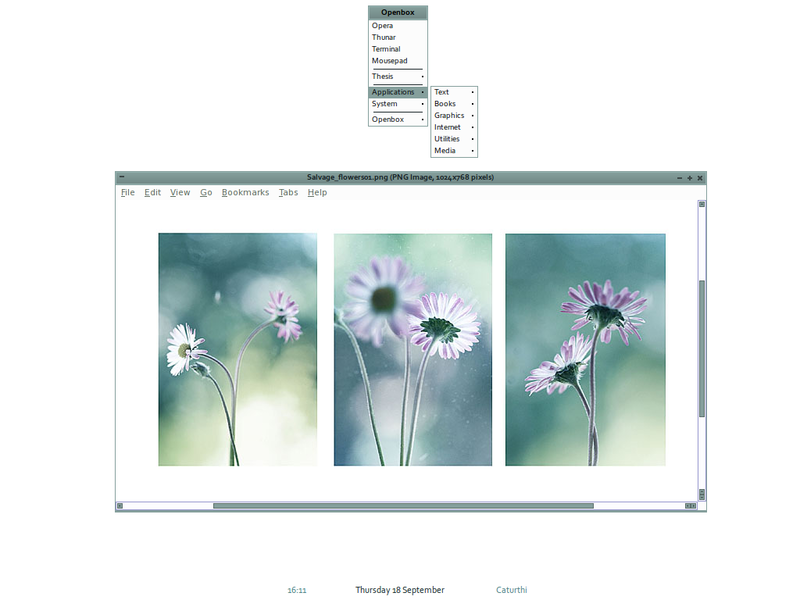 Openbox 3.4 with the Aeterna Openbox and Gtk theme. 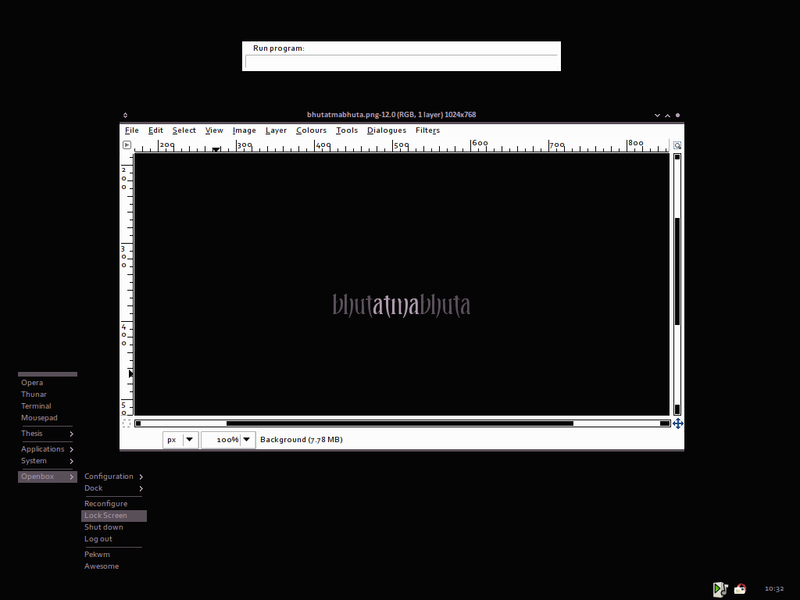 Icons are nuoveXT-1.6, fonts are Heldustry FTV Basic Black (window titles), Arial Rounded MT (Gtk and Openbox menu), and Aerofoil (conky). The wallpaper is a modification of Sparkling colors, seen in the second screenshot. 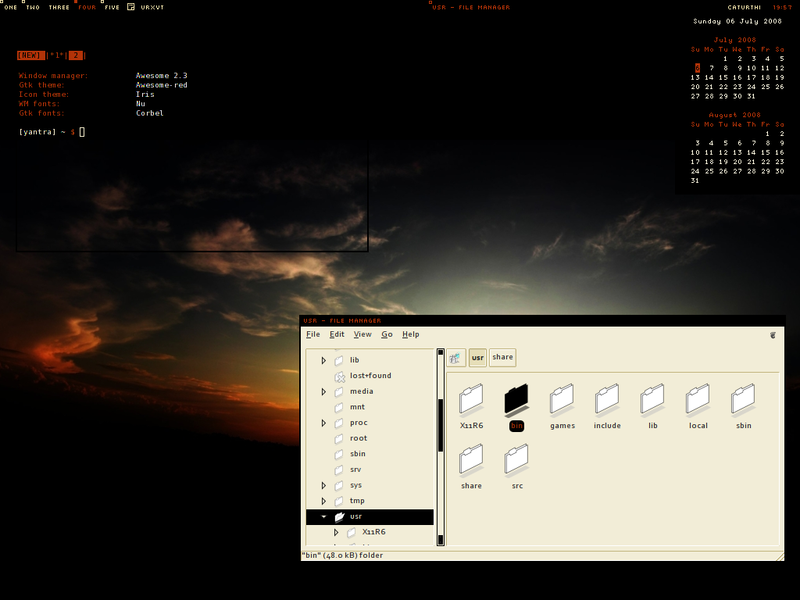 Pekwm 0.1.6 with a slight modification of Mire v2-orange, and a heavily modified MurrinaSunshine Gtk theme. The icons are my own modification of the Area O (areo) icon set, originally created by the great Heylove. 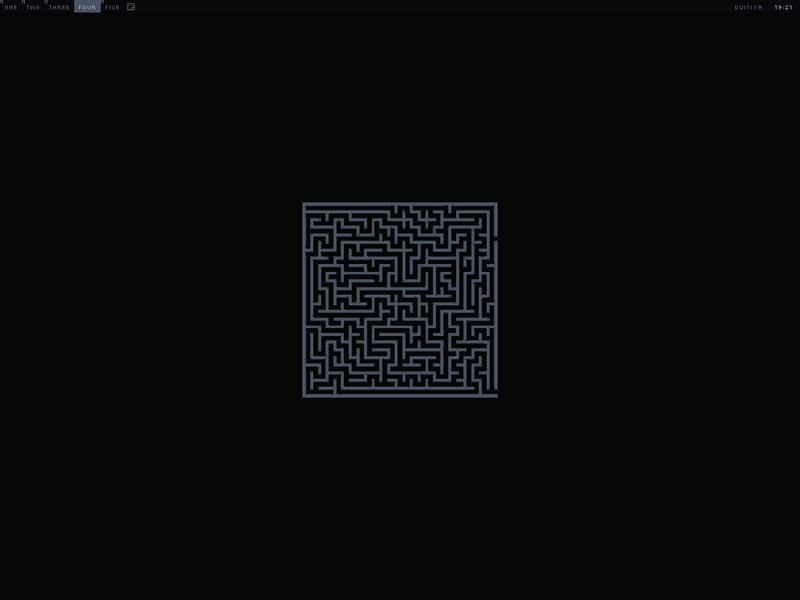 The fonts are Arial Rounded MT 9, and the wallpaper is Golden, by Miemo. More info on this desktop in this post. 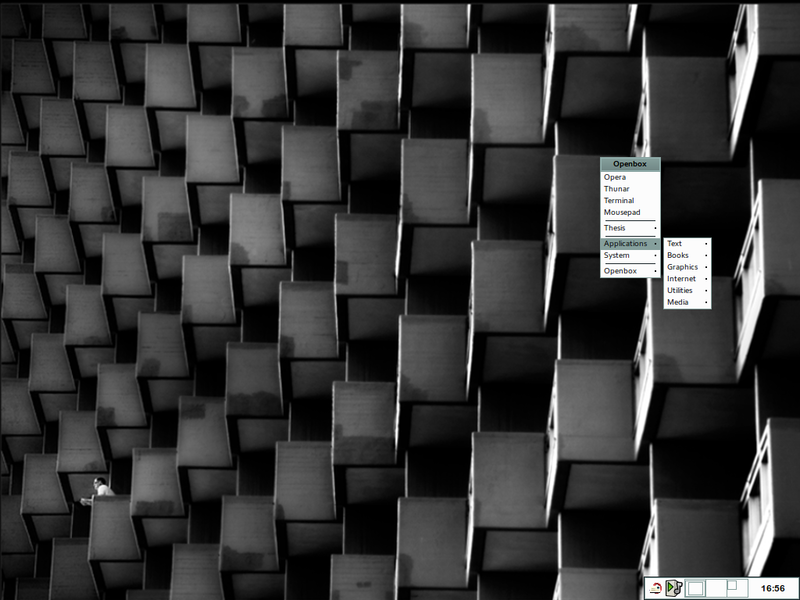 Openbox 3.4.6 with the First Stone Openbox and Gtk theme and a wallpaper made from an image I once found on deviantart. 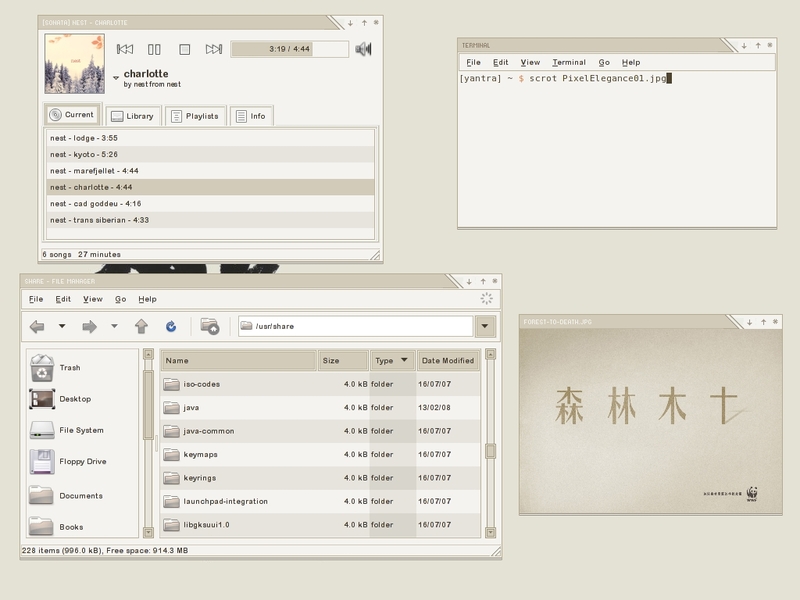 Openbox 3.4.6 with the First Stone Openbox and Gtk theme, and an icon theme I assembled based on the KOMIK icons. I don’t remember where I got the wallpaper image from. 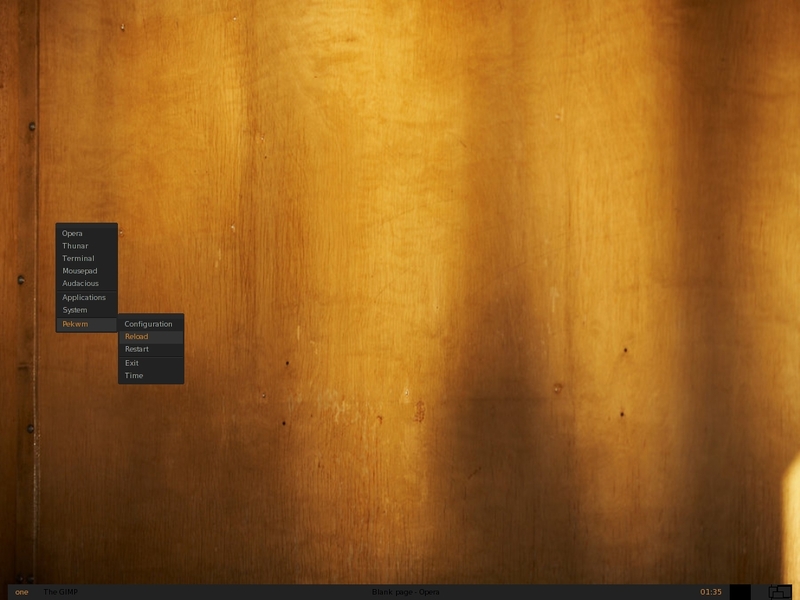 Pekwm 0.1.6 with the Elegance Pekwm theme and the PixelElegance Gtk themes. 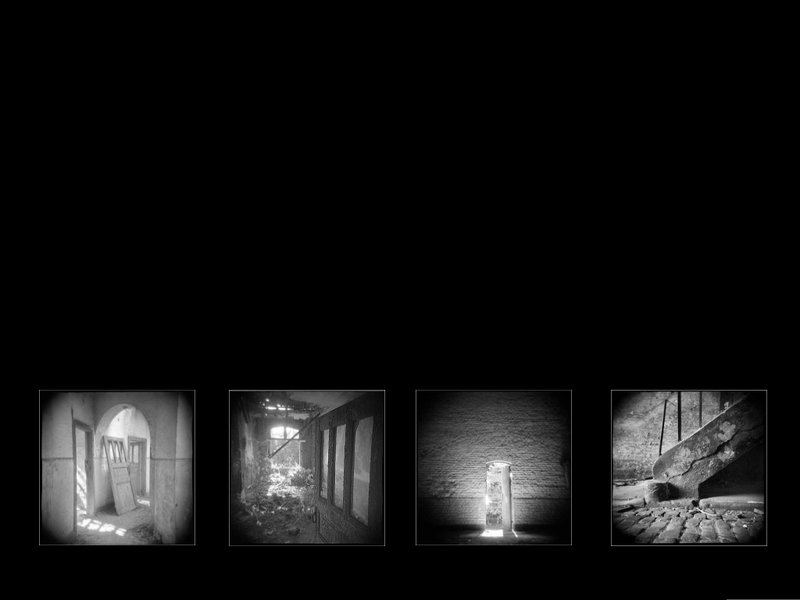 Icons are Human UltraGray. The wallpaper is based on a drawing by H.H. Satsvarupa dasa Goswami. 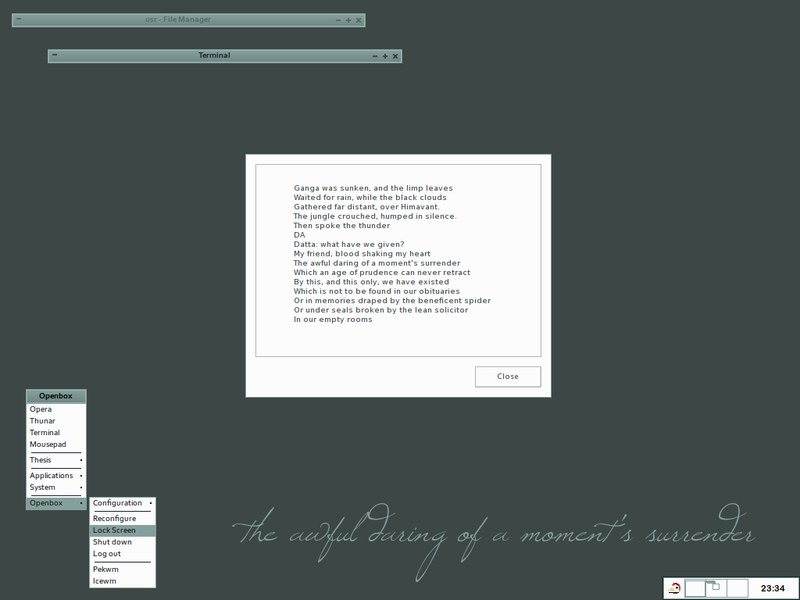 Openbox 3.4.6 with the Awakened Openbox and Gtk theme. 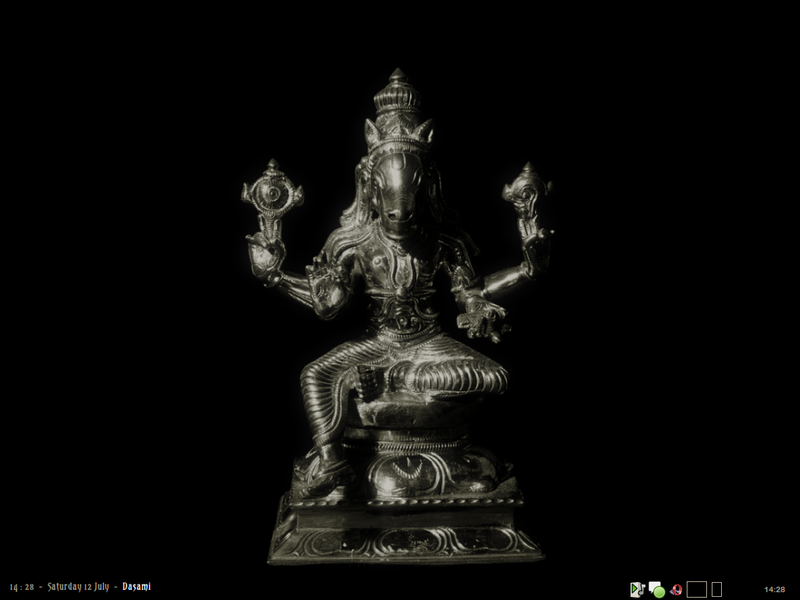 The wallpaper contains a line from the Bhagavad-gita (11.18, second line). 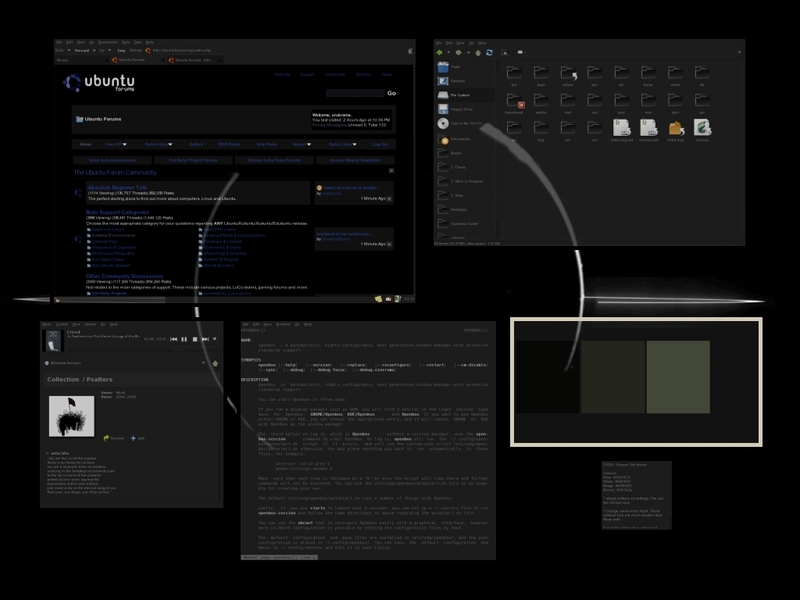 Openbox 3.4.6 with the Into the Unknown Openbox and Gtk themes. Fonts are Corbel and Heldustry FTV Basic Black. 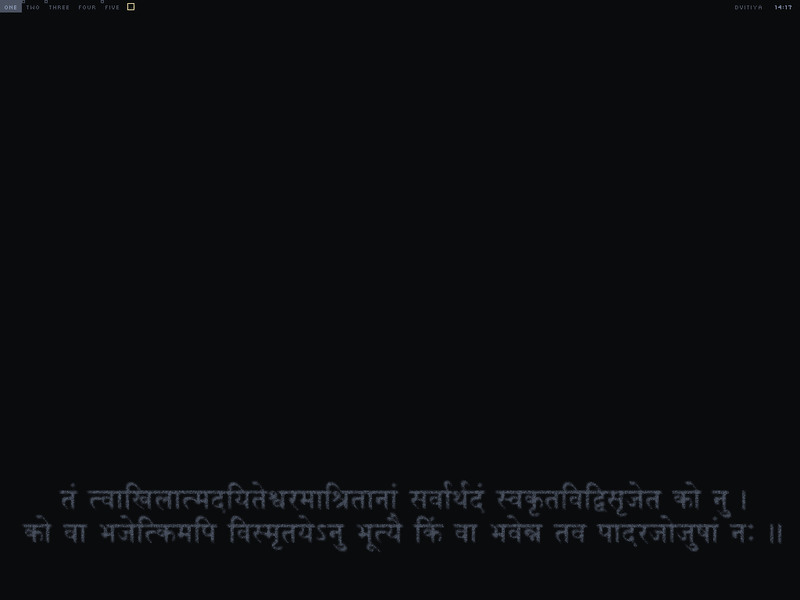 The wallpaper uses some devanagari calligraphy by the late R.K. Joshi. 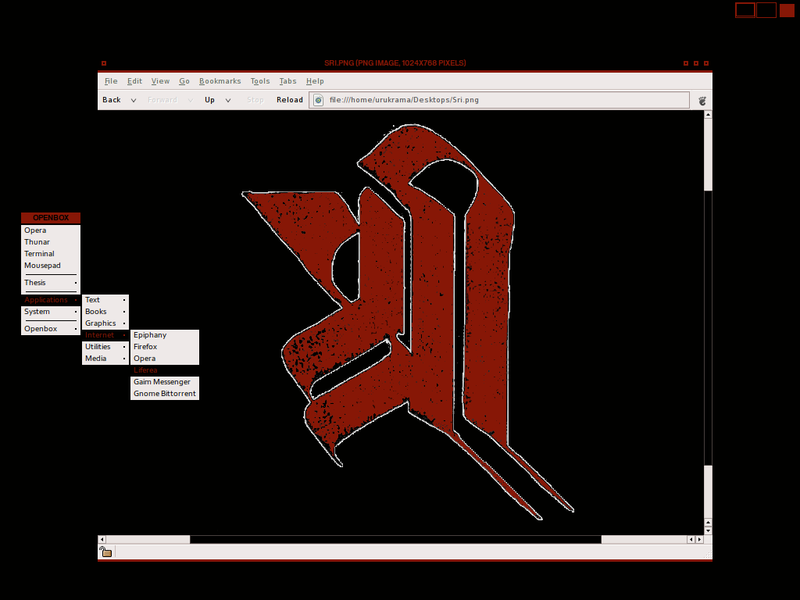 Openbox 3.4.7, with the Salvage Openbox and Gtk themes, FinalOrder icons, and Corbel for the fonts. 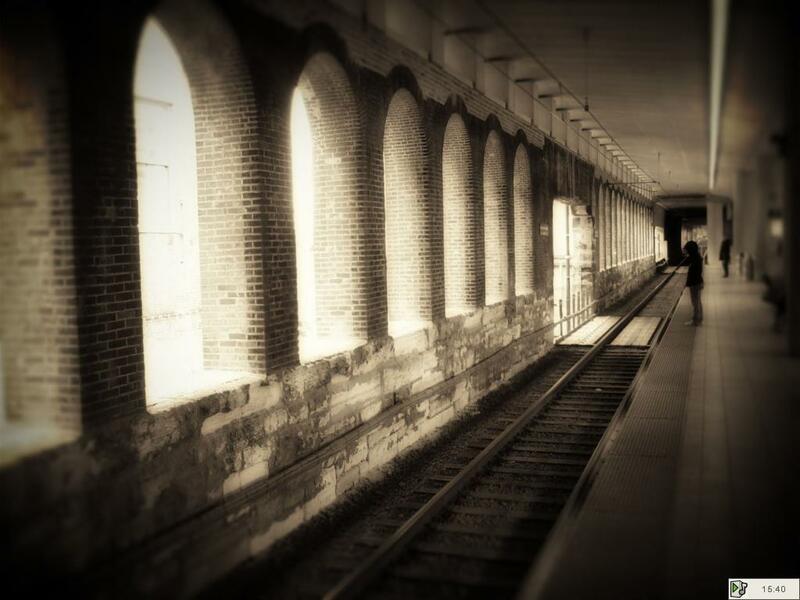 The wallpaper is based on a picture from gilad on deviantart. 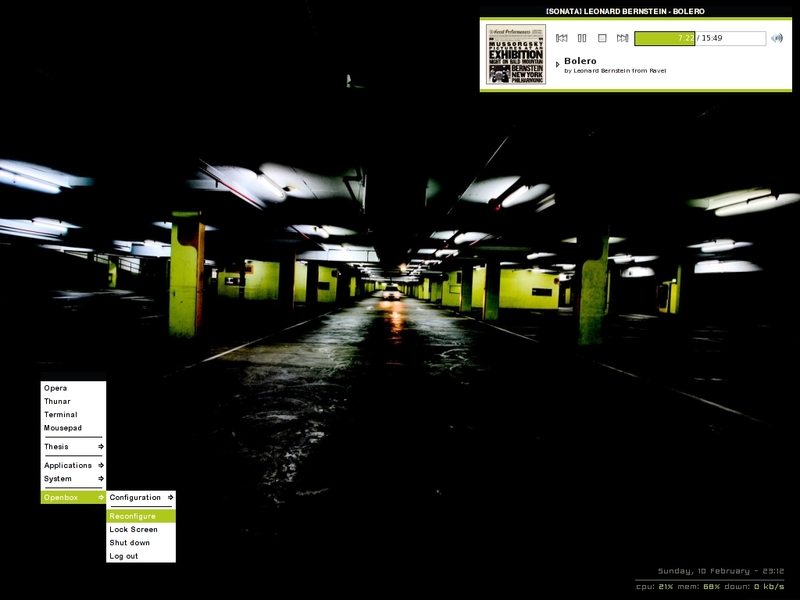 Openbox 3.4.7 with a modified Bygone Openbox and Gtk theme, and a home-made wallpaper. 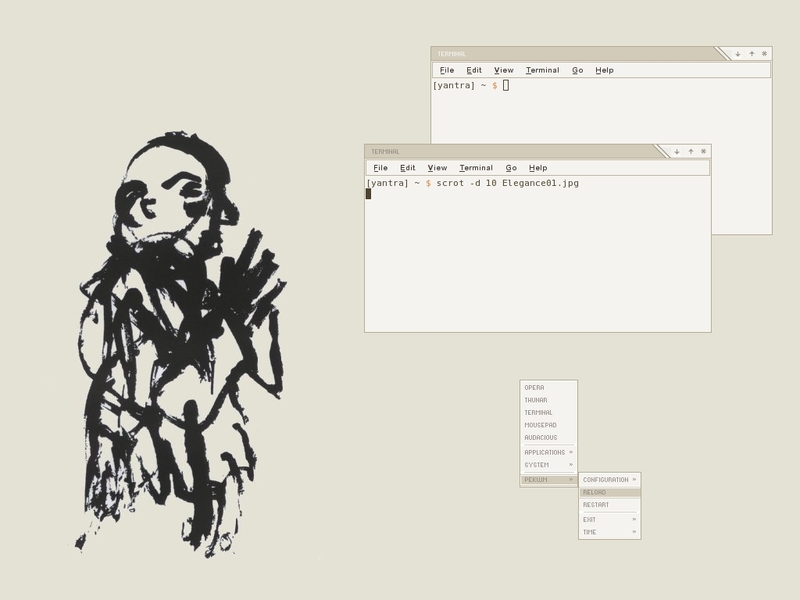 Gnome 2.something, with the Royalty Gtk theme. I don’t remember wherefrom I got the picture used for the wallpaper. Openbox 3.4.7, with the Children of the Earth Openbox and Gtk theme, the Children of the Earth icon theme, and this wallpaper, tinted with hsetroot. Awesome 2.3, with the Awesome-red Gtk theme, and the Iris icon theme. 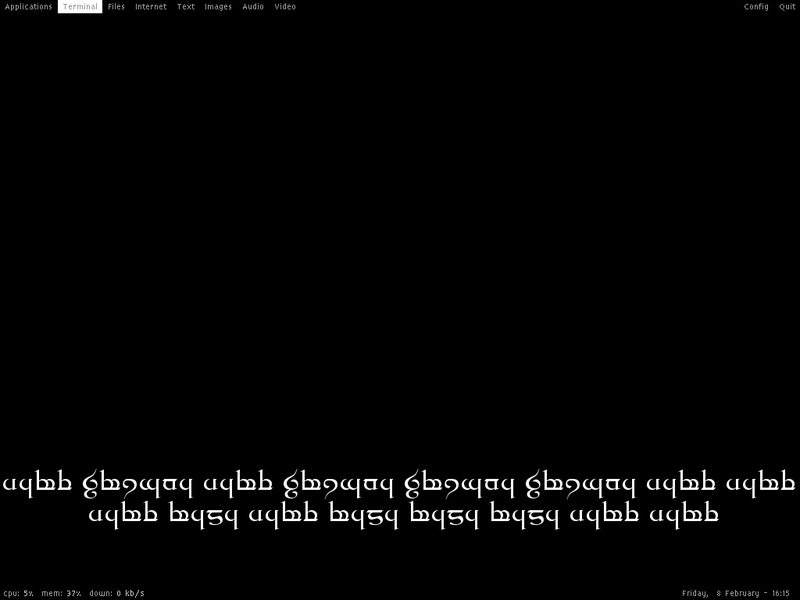 Fonts are Corbel and nu (artwiz). This is my first Awesome setup. 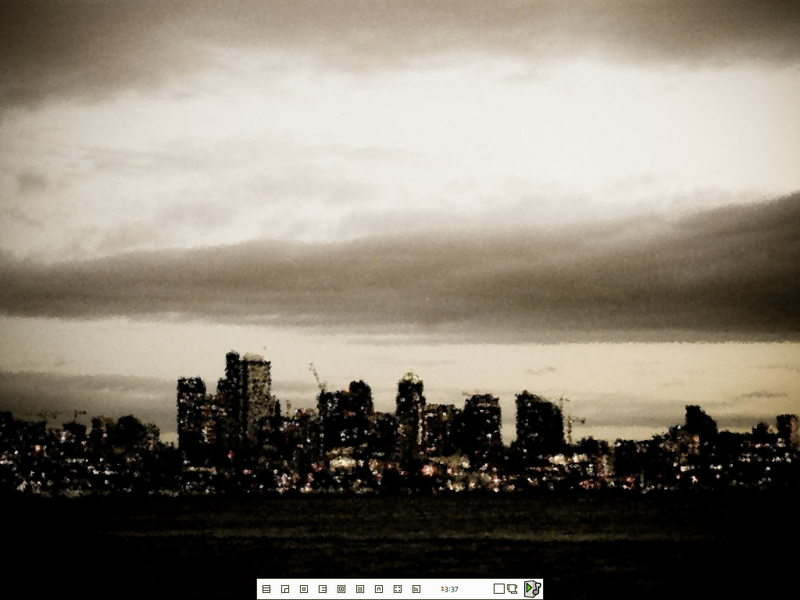 Openbox 3.4.7, with the Children of the Earth Openbox and Gtk icon theme, and a gimped picture of Seattle. 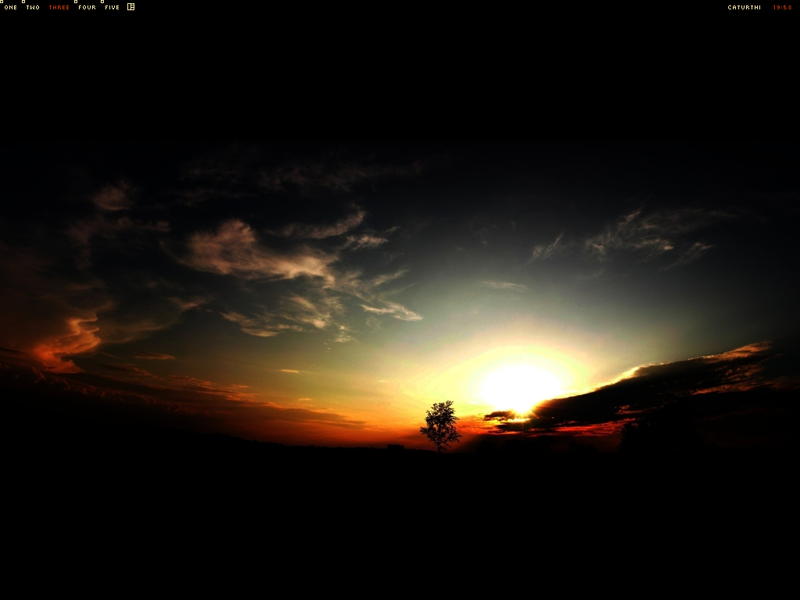 Openbox 3.4.7, with the Mythos Openbox and Gtk themes, and this wallpaper. 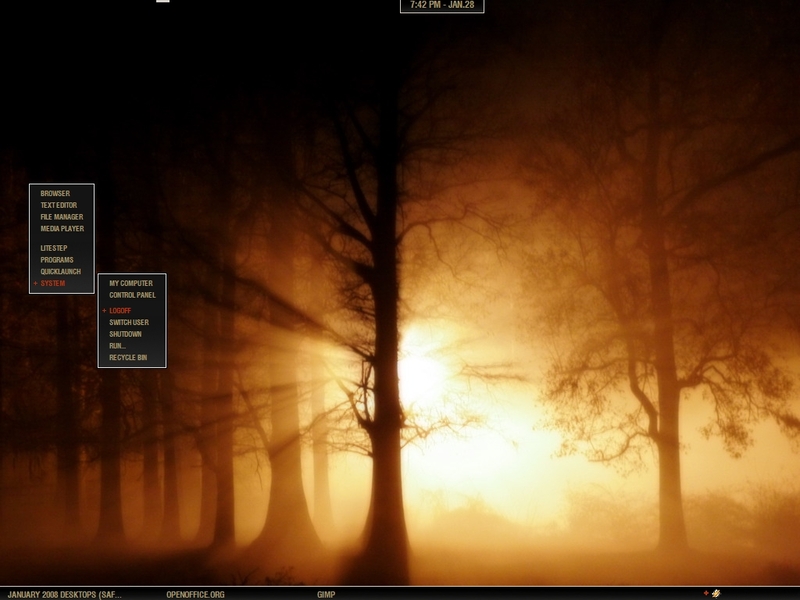 Openbox 3.4.7, with the Dandelion Openbox theme, and the Eidolon Gtk theme. 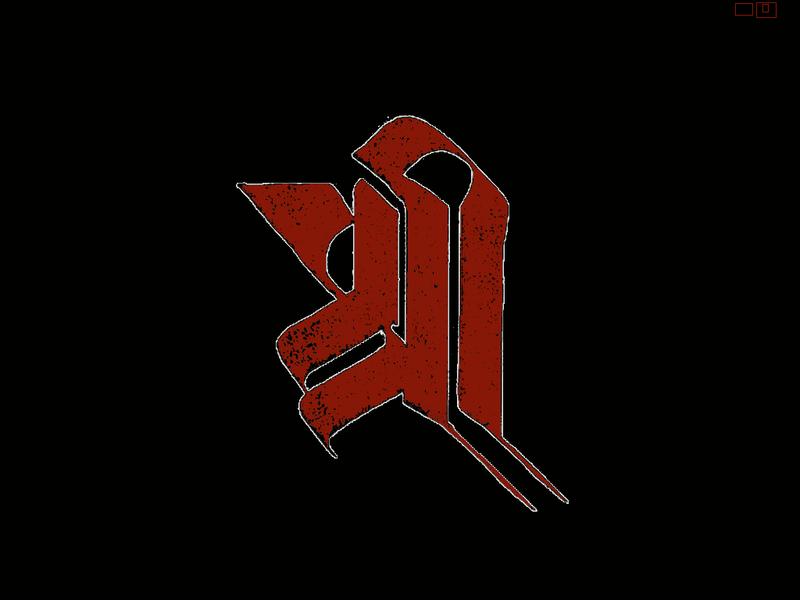 The icon theme is Oxygen Refit (Black). The font is Corbel. 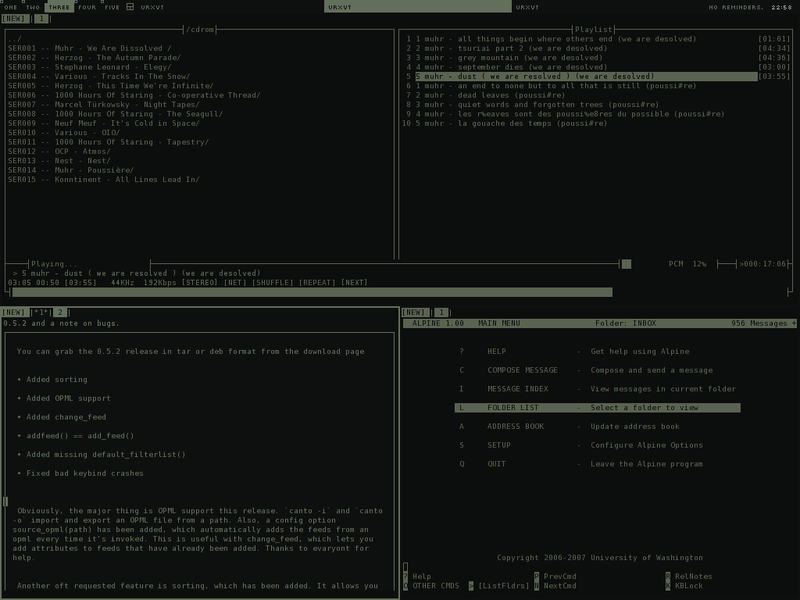 Awesome 2.3, with a colour scheme matching the Mythos Gtk theme. 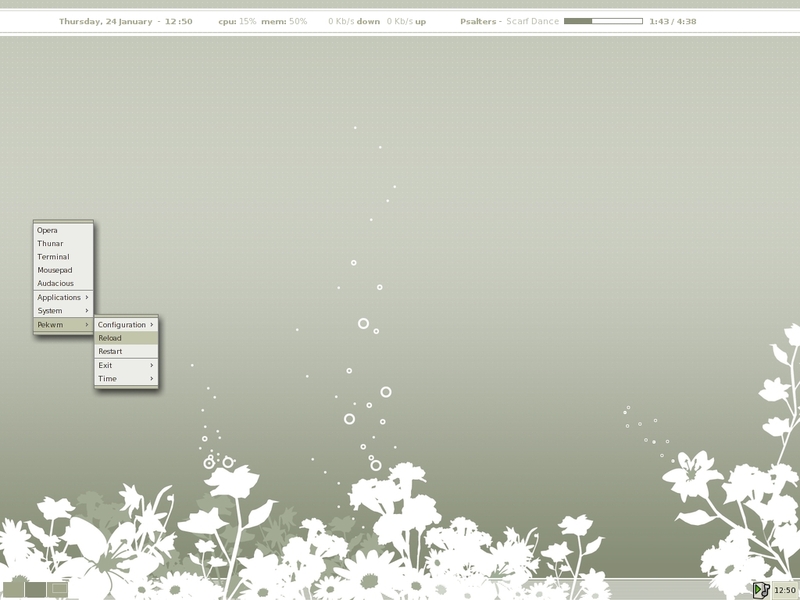 Openbox 3.4.7, with the Children of the Earth Openbox and Gtk theme, and the Children of the Earth icon theme. Fonts are Corbel. I don’t remember where I got the wallpaper from. 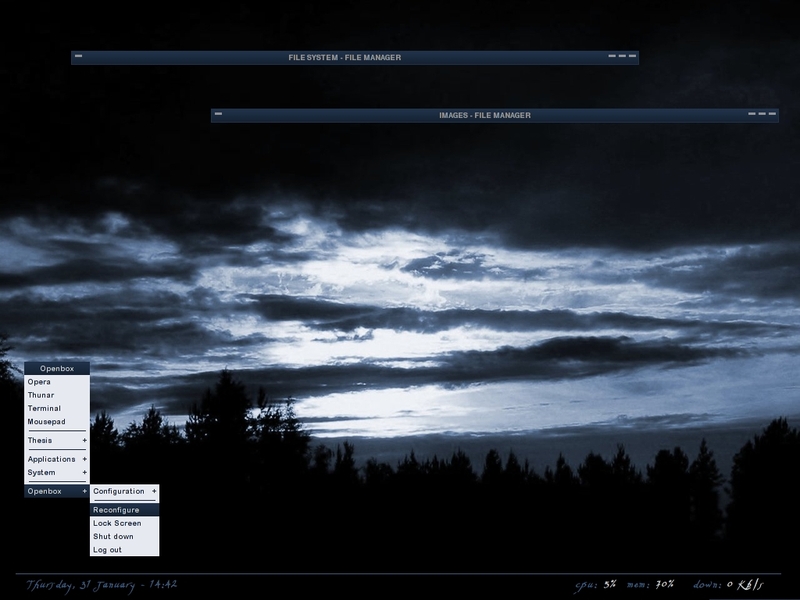 Openbox 3.4.7, with an unreleased Openbox and Gtk theme. 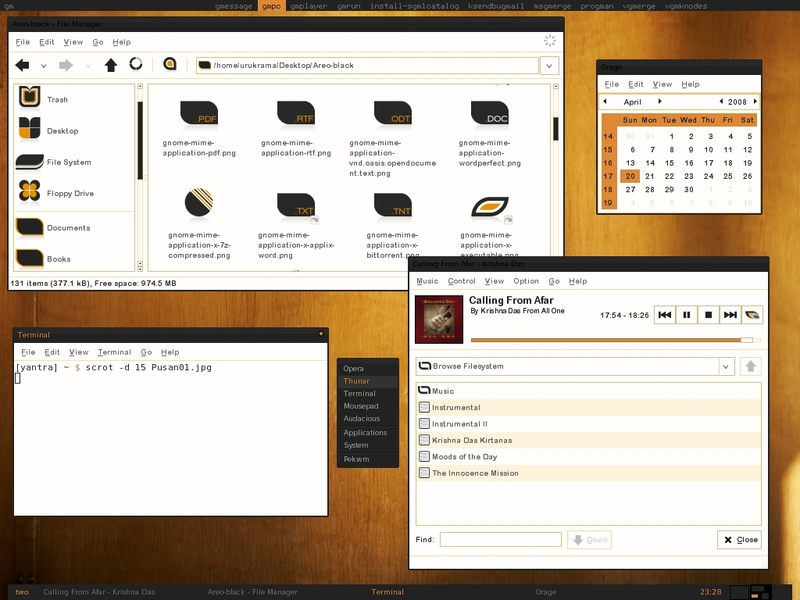 Openbox 3.4.7 with the Salvage Openbox and Gtk theme. Fonts are Corbel and Sans. 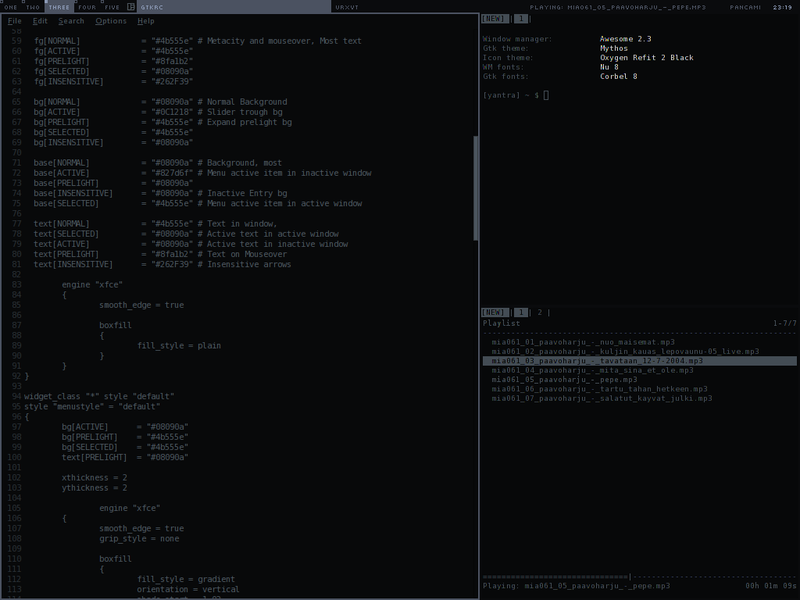 Awesome 2.3, with a colour scheme matching the Mythos Gtk theme. The wallpaper is home-made. Awesome 2.3, with the Eidolon colour scheme. Windows XP, Litestep with the 807 theme (slightly modified) and this wallpaper. 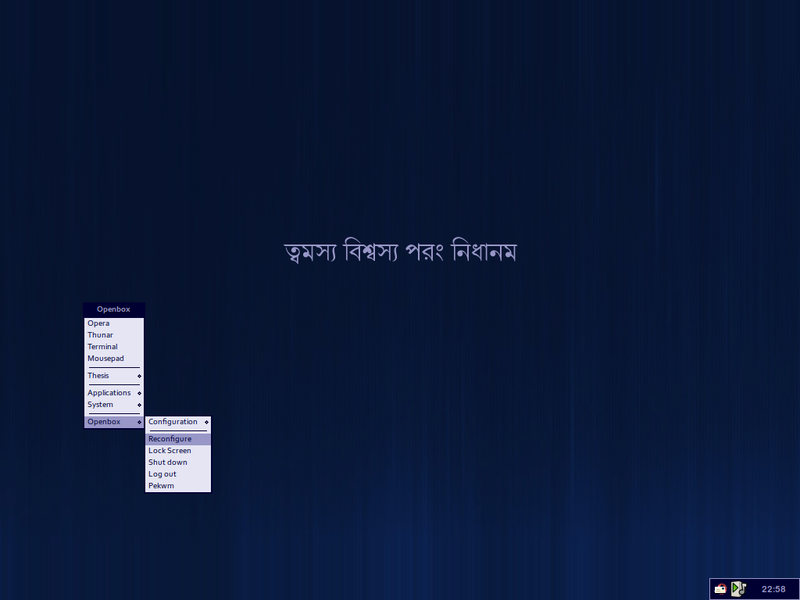 Xfce 4.4.2 with Openbox 3.4. 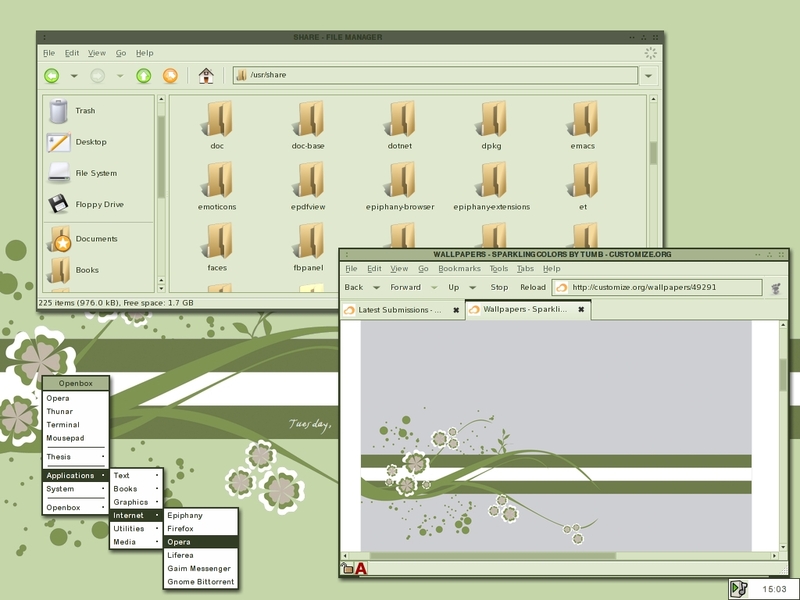 Openbox theme is Fearless, Gtk theme is Murrina-Tangoesque, icons are HumanAzul2, and the wallpaper is from Customize.org. 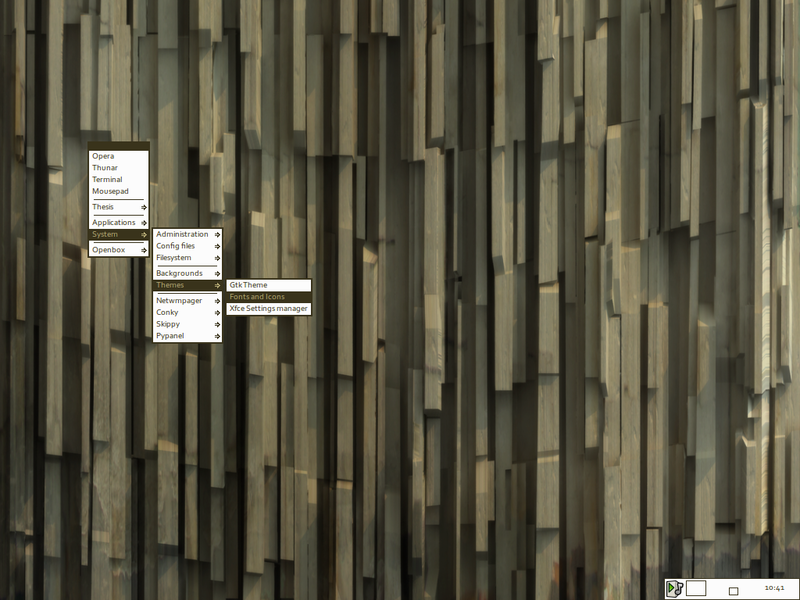 Openbox 3.4.7 with the Salvage Openbox and Gtk theme, Corbel fonts, and a wallpaper based on an image I once found online. 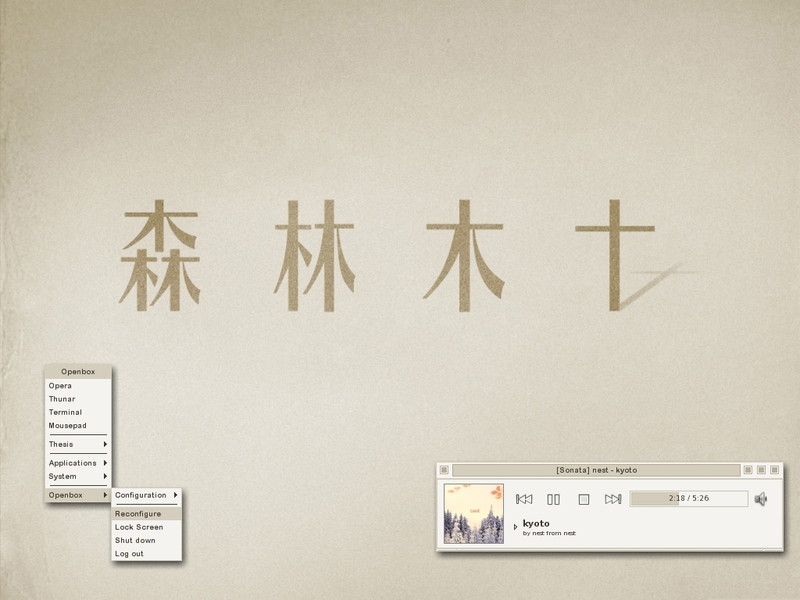 Very cool themes, I especially like to see simplicity combined with some oriental touch! Speaking of Pekwm, I found the option that makes skippy work. Edit .skippyrc so that useNETWMFullscreen = false. Tested with Skippy and pekwm 0.15 from Debian testing repos. I really like the combination of the Fearless Openbox theme and Royalty Gtk theme. Going to give it a try, instead of my usual 1977-Black with clearlook. i like your awesome desktops but tell me have you done anything similar with awesome three and is so are you planning on releasing the details? Thank you, John. I haven’t really used Awesome 3. I continue installing Awesome 2.x, building it from source. I don’t like the direction Awesome took with 3, but still like the 2.x versions, so I keep using that. thank you for your reply. i like the lua programming language so i’m sticking with 3.x. first attempts at customising are going really well. however, i can’t find your awesome-red gtk theme or corbel/nu (artwiz) fonts via google and the iris icon theme on gnome-look is broken 😦 also, i much prefer your layout icons (i.e. in the status bar next to your tag list) over standard icons. how would one go about using them? thank you. 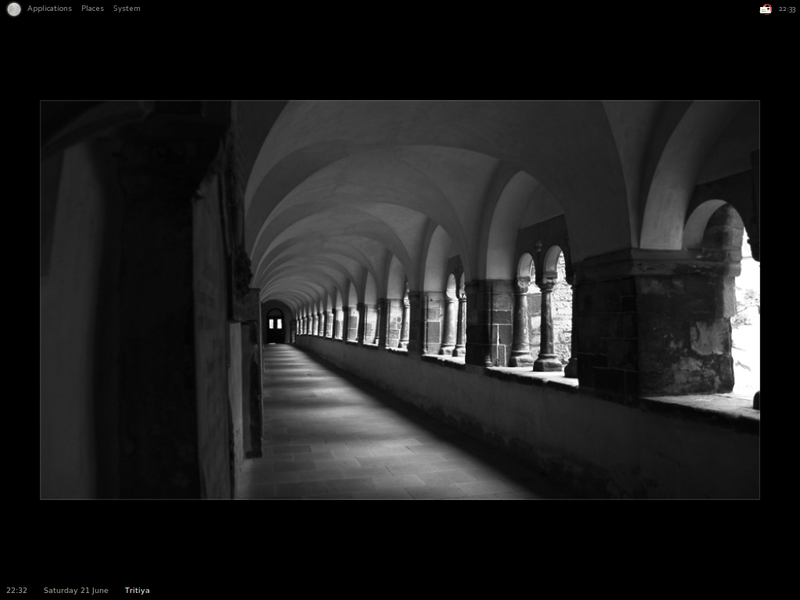 I’m really impressed with your desktops… they’re really really beautiful and simple. I’ll try some of the Desktop managers you’ve used. thanks for sharing your stuff. I love the wallpaper you used with the Awesome-red Gtk theme. Is it your own or is it available on the inter-webs? Thanks!